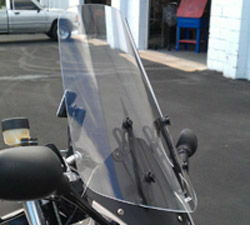 "I just wanted to say thanks for the great windshield -- it's a big improvement over the stock BMW F800ST screen. I had a nice, comfortable freeway ride yesterday and could actually hear the engine for a change instead of getting whiplash every time I turned my head. So, again, I say thanks for a great product!" "I have the windshield installed and have logged over 600 miles thus far. The answer to my problems can be stated on one word: SOLVED! I have the lower brackets installed as shipped so I can move the entire assembly up only about 2/3 of the way and that's where it is now. 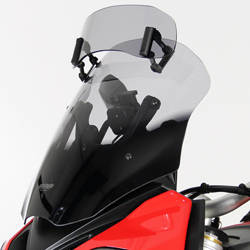 The windshield stands up more or less straight because tilting it at fork angle increased noise around the helmet. As is, it's real quiet and ZERO turbulence unless I sit up unnaturally high. I may have to adjust even higher after I install my bar risers. This is the single best adder I've made to the F800ST. Thanks!" 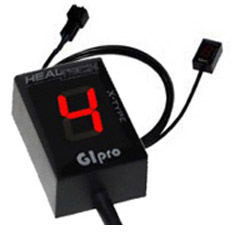 "The quiet air bubble isn't as large as that provided by my previous motorcycle, but is excellent considering how narrow your screen is across the top and the fact that this final position is well below my line of sight, so low that I can't believe it's working this well. The space between the cowl and screen (approx 1 inch at the bottom) appears to contribute to improved laminar air flow and resulted in no significant buffeting around my helmet at any of the tested screen heights/angles. Just the smooth laminar air flow is an unbelievable improvement over the OEM or the 18 inch VStream screens previously installed on my BMW F800ST and is sufficient reason to change to your system." !quote, screens, 06, 07, 08, 09, 10, 11, 12, 13, 14, 15, 16, 17, 18, 19, 20, 2006, 2007, 2008, 2009, 2010, 2011, 2012, 2013, 2014, 2015, 2016, 2017, 2018, 2019, 2020!